In 1853, three years after he married Elizabeth, the daughter of wealthy merchant Henry Remsen, Joseph Grafton built his brownstone mansion at No. 307 Fifth Avenue, just two blocks south of the Astor mansions. He traced his roots to the Grafton family of colonial Massachusetts, and was the brother-in-law of the socially visible Charles H. Minot of Boston. That “large estate” was later reported to be over $1 million. Shortly after her husband’s death Elizabeth donated a valuable collection of art objects to the Metropolitan Museum of Art. She also seems to have been suffering from dementia; for on March 9, 1901 Amelia Stuyvesant presented a petition to the Supreme Court asking for a ruling regarding the Elizabeth’s sanity. “It is claimed she is mentally unfit to take care of” her inheritance, explained The Times. Fifth Avenue between 31st and 32nd Streets was no longer the exclusive residential address it had been in 1853. The old Grafton mansion was surrounded by commercial concerns and in 1904 Joseph Grafton’s nephew, Joseph Grafton Minot of Boston, leased the house to Densmore & Compton. The firm had already contracted to erect a new building on the site. The subsequent five-story commercial structure was home to realty, architectural and apparel firms. In 1917 one tenant, the Hamilton Garment Co., not only renewed its current space, but signed a lease on the entire building. Three years later the aging Joseph Minot Grafton sold the property—the first transfer of title in 67 years. Rapid commercial development of the neighborhood resulted in the looming Schwartz Building. Next door the five-story structure at No. 307 can be seen. Buildings come and buildings go in New York City and 14 years after the five-story building was constructed, plans were in the works to tear it down. 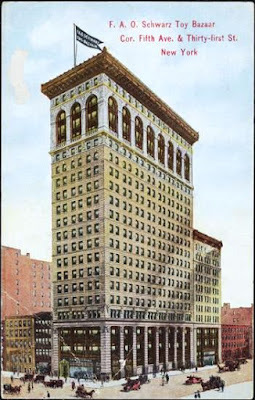 On June 21, 1928 owner William H. Jacobus announced he had signed a $1.5 million, 63-year lease on the property with Conrad Glaser, President of the 307 Fifth Avenue Corporation. Conrad Glaser, who was not only a real estate operator but a builder, commissioned William I. Hohauser to design the new office and showroom building. Best known for his theater designs, the architect would make Art Deco—the architectural style that defined Jazz Age Manhattan— unabashedly evident on Fifth Avenue. Bizarre faces within the end capitals join with the riotous blend of swirls, zig-zags and geometrics designs. The newspaper did not mention the vibrant Art Deco decorations—a shallow cornice above the second floor composed of stylized floral baskets; alternating spandrel panels of swirls and geometrics; and fluted pilasters capped with complex capitals. Hohauser’s elaborate terra cotta decoration was interrupted at the 7th through 16th floors where more tepid geometric designs in brick took over. The wonderful terra cotta cladding resumed at the top two floors. A midsection of more orderly brickwork gives way to another explosion of Art Deco ornament at the top most floors. On the day of its opening the building was 70 percent leased to a variety of tenants including apparel firms, a real estate leasing company and the Garrison Fire Detection Company. On May 8 a flurry of leasing took place. The Reich-Ash Corporation, makers of cosmetics; the Silvercraft Specialty Company, and the Antique Novelty Box Company took space. Management announced that now 16 floors of the building were rented. The diverse tenant list included brokers, and even the Childhood League (the purpose of which was to “emphasize the importance of play in the formation of character”) and the Animal Protection League. While the brokers dealt with their legal problems, Daisy Miller, President of the Animal Protective Union worked on a far different crisis. Norwegian Christoffer Braathen had been a dog-sled driver with Admiral Byrd’s expedition in the Antarctic. His lead dog, a Husky named Moose-Moss-Mouse “was ugly to most people, but to Chris he was gentle, a friend,” said The Times on September 18, 1930. Braathen was so fond of the Husky that when the other sled dogs were shipped home on the whaler C. A. Larsen he smuggled him aboard the City of New York and brought him to Manhattan. When the weather was bad he brought the dog into his cabin. When the festivities surrounding the Byrd expedition were over, Braathen got a job as chief engineer on the yacht Carib, owned by Bostonian Thomas Johnson. He left Moose-Moss-Mouse with George A. Thorne, Jr., who had been chief surveyor of the Byrd expedition. Thorne’s home was in Glen Cove, Long Island. More apparel firms moved into the building in the early 1930s. Kastenbaum and Wollstein, “hosiery and underwear;” leather goods dealers Veramode Company, Inc. and Louise Merzbach and Arnold Diamond; garment maker David L. Rubel; and Alfred and Frank Ehrenreich, “fancy goods,” all moved in in 1931. Other tenants included the newly-formed publishing firm Carlyle House which released its first book, Trial and Error—Writing and Selling, in 1933. In it author Jack Woodford advised would-be free-lancers that fifty-thousand words too many for the equipment of a free lance writer” and admonished “one of your first jobs, as you write for money, will be to get rid of your vocabulary." The Depression years brought about Governmental efforts to stabilize the economy. Yet in doing so, the best interest of the citizenship as a whole sometimes flew in the face of the interests of the individual. Gordon S. Harris, who operated his automobile business from No. 307 Fifth Avenue, found this out in February 1934 when he sold a car for $50 less than the list price of the Motor Vehicle Retail Code. Unfortunately for Harris, his customer was a government agent. Harris was found in violation of the New York Shackno Law. When he was found guilty following his two-day trial, the defiant and angry dealer refused to pay the $500 fine. To make his point he settled on three months in the workhouse. The wide variety of tenants continued throughout the coming years. The Pro-Palestine Federation of America was here by 1936 as was the Educators Association, Inc., publishers of encyclopedias. That firm would remain in the building well into the 1950s. In 1941 the Fifth Avenue Public Service Bureau was here, helping to direct funds to Hungary and Slovakia; and the Russian-American Committee to Aid the Fighting Forces of Soviet Russia opened its offices on October 18 that year. In 1991 the existing storefront was replaced and in 2007 a year-long façade restoration was initiated. At that time the two-story front was replaced again. But, although overshadowed by the soaring Schwartz Building next door, William I. Hohauser’s wonderful Art Deco sliver survives above the second floor.